Guess who was NOT amused that he had to stop chasing the chickens and come sit on the bench for a family pic? 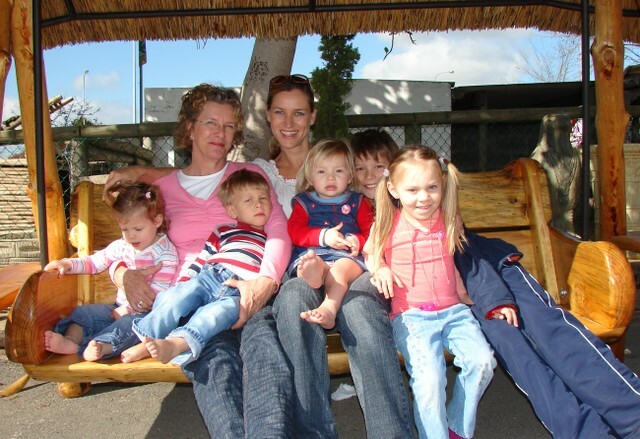 From left to right: Kate, my mom aka Mimi, Happiness, sister Mel, cousins Sofia, Daniel and Rebeka. Not in the pic is cousin Lily-Rose who lives in Taiwan. What a gorgeous family you are! Beautiful family. What a hot grandma. I hope I look 1/2 as good when I'm her age. Wait, I don't even look 1/2 as good at 36.